In connection with the launch of Warm Nordic on March 22, 2018, the new Danish design brand has created an exclusive special edition of Hans Olsen's Iconic Gesture Chair, originally designed in 1957. Gesture Chair 1st Edition is available only until April 30, 2018 and is a tribute to artful, edgy design that lasts for generations. 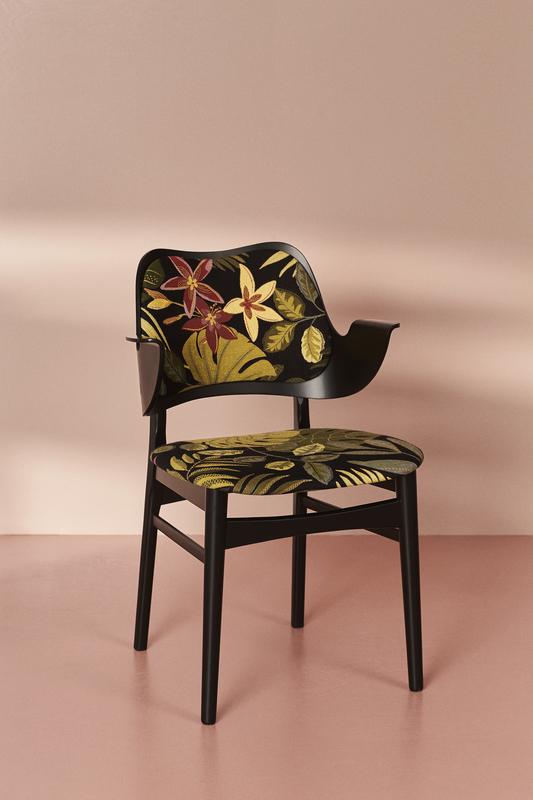 This collector's object from Warm Nordic is set in black-lacquered oak and is covered with colourful flowered textile that reflects the brightness of the 50's, and it is unique to Gesture Chair 1st Edition. 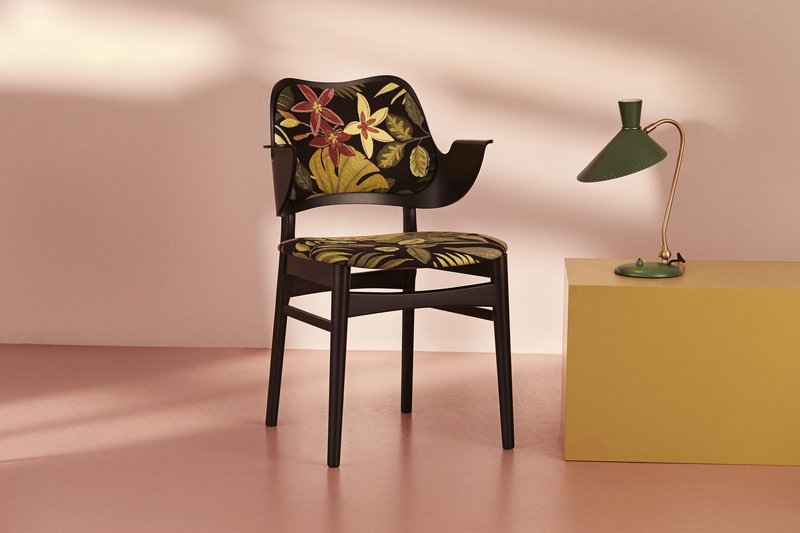 The fabric has been carefully selected for its sensual and vibrant motif, which complements the chair's organic, tapered design that Hans Olsen experimented with. The renowned Danish architect put his own flair on Danish modernism, and several of the original design classics from Hans Olsen's hand are sold for high bids on international auctions. For Frantz Longhi, the architect and founder of Warm Nordic, it is a passionate mission to give new life to the classics from the golden age of Scandinavian furniture design. To expose them to a Danish and international audience of design lovers while continuing the design heritage with an exclusive collective item like Gesture Chair 1st Edition. - With the special edition of the Gesture Chair, Warm Nordic celebrates an iconic design of a quality and beauty that lasts for generations. We fell in love with the eye-catching textile that both emphasizes the chair's own personality and emphasizes Hans Olsen's legendary and courageous approach to design, which has made him famous throughout the world. Gesture Chair 1st Edition is an original piece of design furniture and beautiful artwork that makes sense to invest in. This is an opportunity for those who are with us right from the start, and for us to thank them for the great support for Warm Nordic, says Frantz Longhi, who himself is a passionate collector of iconic Scandinavian design. Gesture Chair 1st Edition is created as an original Warm Nordic collector's item that not only contributes to diversity and depth in modern decor, but will also be able to continue the story and eventually find way for international auctions. Gesture Chair 1st Edition is an elegant and distinctive design chair, which is balanced by a light and playful attitude. Above all, the chair with its unique blossomed textile is generous with both warmth and soul. The armrests invite to sit down in the seat and are designed so that you can move up close to the table. almost like the character of an attractive piece of art. The classic Gesture Chair was originally designed in 1957 by architect Hans Olsen, who experimented with original design furniture. The chair is also known as model 107. The Gesture Chair is shaped in one piece and is both a beautiful and ergonomically successful result of Hans Olsen's fascination with this production method. As such, the design captures the spirit of time in the 50s, where experiments, courage and handmade led to world-class furniture art. Warm Nordic, in dialogue with Hans Olsen's family, are managing the design heritage of the great architect and Warm Nordic will continuously launch more uncompromising designs from the House of Hans Olsen. Hans Olsen's remarkable design from the 50's is a living example of the diversity of Danish modernism. The Danish architect and industrial designer took the classical virtues from the art academy and the teacher Kaare Klint, but chose a more playful and experimental approach to furniture design.